With the departure of Vini “Mad Dog” Lopez and David Sancious, and the addition of The Professor, Roy Bittan on piano and “Mighty” Max Weinberg on drums, Bruce’s music lost some of its jazz-like qualities and went more rock – extraordinary rock. Born to Run also shows the maturing of Bruce Springsteen, in the way that the male of our species matures I guess. He was a punk kid in his first two albums, and now he’s become a punk man, with regrets, responsibilities and an implausible dream. And he’s always trying to convince the girl. My other favorite Bruce song, “Thunder Road” is on this album. There is no chorus, no repeating, no stopping, just moving forward at a manic pace, changing tempo here and there. And I know all the words. I remember driving back from some party in a wealthy neighborhood somewhere in Connecticut in the wee hours of the morning singing “Thunder Road” with my Bruce lookalike boyfriend, impressing my friend that just passed and her brother’s wife, who were sitting in the backseat of my Corolla. I also remember impressing a bunch of strangers at the party, including some guy named Terry, who was a quarterback for the Pittsburgh Steelers that wasn’t Bradshaw, and some 21-year-old lacrosse player, his 30-year-old girlfriend and their friends, with my ability to remain standing, or seated on a barstool, after multiple shots of vodka. I had no choice. We were so out of our element. There had actually been a woman sitting on the couch at one point, who was married to the producer named Duke and was stroking a little foo-foo dog that she held on her lap. I went off to get shot glasses and the vodka because I thought we needed to do shots, and when I came back in the room, my crew was gone, and I didn’t see them for the longest time. Turns out they went to the basement with the musicians. When they finally returned I was quite tipsy and I think engaged to the lacrosse player. I was not the driver back to New York. But that was 1982, and we are actually talking about an album that came out in 1975, when I still didn’t know who Bruce was, but had started to hear bits and pieces. 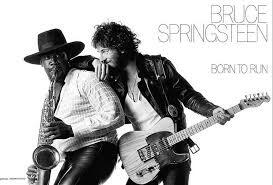 Born to Run is another amazing album, though I don’t think it’s on the Ram alternative list. It not only has the title song and “Thunder Road,” it has the incredible “Jungleland.” Who doesn’t love good sax? And this is great sax. The story line, the street life, Clarence Clemmons’ wailing saxophone cutting through the night montage. So cool. There’s also “Meeting Across the River,” which a friend confessed always made her cry, and “Backstreets,” which I have to admit that the part where Bruce repeats “hiding on the backstreets” like a dozen times, which I used to so get into, I now find a bit tedious. Eh. Growing up. What can you do?